Kaby Lake-R has proven to be much more capable than the 7th gen Kaby Lake U-series to the point where performance can rival a Core i5-7300HQ. If Whiskey Lake-U will be similar, then it would be the perfect candidate for entry-level gaming laptops like the Asus ROG GL series. We reported a couple of weeks ago that the official Asus product page for the GL503 gaming laptop was listing unannounced Core i5-8265U and i7-8565U CPU options. The page has since been corrected to say Core i5-8300H and i7-8750H but not before we were able to capture a screenshot of the original specifications. Like a game of whack-a-mole, however, Asus' attempt at plugging one hole has simply caused the same leak to appear on yet another official product page. 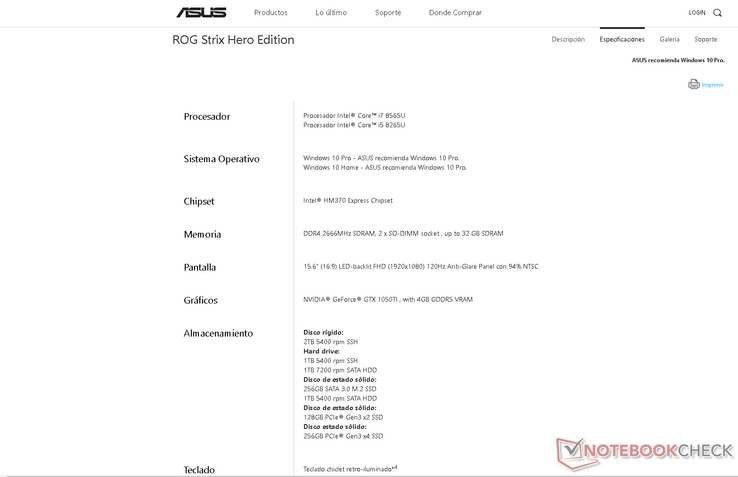 The Spanish product page for the 15.6-inch ROG Strix Hero is currently listing the same Core i5-8265U and i7-8565U options that were pulled from the GL503 product page above. There was a chance that the new CPUs were genuine errors when they were discovered last month on the GL503, but for these exact same processors to pop up again on another similar Asus laptop makes the original "error" much less of a coincidence. If the leaks are true, then it would be the first time that an Asus ROG laptop is offering Intel U-class CPUs. When compared to the more demanding 45 W Intel H-class, the 15 W Intel U-class can potentially lead to cooler temperatures and quieter fans without affecting gaming performance. 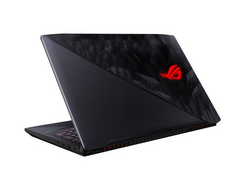 The Core i5-8250U and i7-8550U, for example, have proven to be comparable to the i5-7300HQ commonly found on entry-level gaming laptops like the Asus GL503 series. Other OEMs like Lenovo have also been hinting at Whiskey Lake-U laptops as well. Collectively, these leaks strongly suggest an official reveal of Whiskey Lake-U at IFA 2018 later this month.